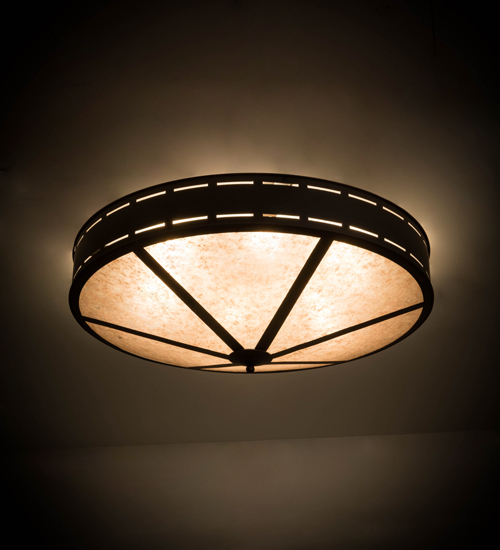 Description: Evocative of the Craftsman period, this handsome ceiling fixture adds warmth and authentic appeal to interior spaces while creating a visually pleasing experience with welcoming ambient light. Stunning Silver Mica complemented with an Oil Rubbed Bronze finished frame and hardware result in a ceiling fixture that is ideal for a wide variety of homes and hotels, restaurants and other commercial spaces. The fixture illuminates with 6 customer-supplied compact fluorescent lamps. Handcrafted at the foothills of the Adirondack Mountains in the USA, this fixture is available in custom styles, sizes and colors, as well as dimmable energy efficient lamping options. The fixture is UL and cUL listed.